Additionally we have to charge Euro 1,65 local tax per person/day. Dogs are not allowed in the restaurant and the wellness area. For each dog we charge Euro 9,00 per day. For bookings up to 90 Tage prior to arrival we grant you a 5 % discount for lodging! For short stays up to 2 nights we charge Euro 5,00 supplement per person. For overnights/breakfast we deduct Euros 12,00 from the above mentioned rates. The prices are per person and per day without board – half board available on request! Our high-quality, comfortable and nicely furnished rooms of different categories lead to a successful and completely comfortable stay also during the winter months. 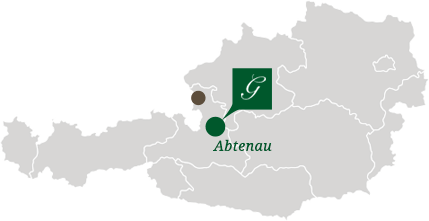 Relax in your own home after an exciting day skiing on the excellently prepared ski slopes of our idyllic holiday region: Whether a holiday double room, holiday single room or the Panorama Suite – the Active and Wellness Hotel Gutjahr in Abtenau welcomes the winter! Please note that we charge a supplement of Euros 40,00 per person for New Year´s Eve. Children up to five years are free of charge and there is an extra charge of Euros 15,00 for children from the age of six to nine years and 21,00 euros for children from the age of ten to fifteen years. This includes all attractions, which will be offered by the Hotel Gutjahr at New Year´s Eve, like musical performances, culinary snacks at midnight as well as a glass of Prosecco or juice served punctually at midnight. Our Hotel not only offers you fantastic 4-star level rooms as well as an exclusive Panorama-Suite. Upon request you have the possibility to enjoy your individual holidays in one of our four apartments. Only eighty meters from our main building, our apartment house offers you perfect conditions for an undisturbed, individual stay, where privacy is of great importance. With a reservation of up to 90 days prior to arrival, we will grant a 5% discount of the lodging price! For a short stay up to 2 nights, we charge a supplement of Euros 5,00 per person. Additionally we have to chare a daily local tax per person. As per June 2016: Euros 1,65 per person and per day. For overnights/breakfast we deduct Euros 12,00 of the above mentioned rates. It goes without saying that you have the chance to enjoy the many benefits of a holiday stay in one of our perfectly furnished holiday apartments all year long. Whether in the summer or during the cold winter months: the apartments of the Active and Wellness Hotel Gutjahr in the Salzburg Land attracts with unforgettably relaxing holiday moments exactly the way you like it – and this with reasonable prices!